I’m having an exhibition. Please come along. These paintings all began upstairs in the life drawing room of the Mary Ward Centre. There is a great feeling of energy between the artist and sitter and this gets translated onto paper. The look of the model suggests narratives, the time limit inherent in the session creates drama and the size of the works shows up each mark made. At the age of sixteen I went to art college. Since then there has always been two parallel careers: graphic design and fine art; each informs the other. In recent years there’s been more and more paintings, commissions and exhibitions. – Wanda Szwed, Islington Exhibits on the Viewing/Making exhibition. 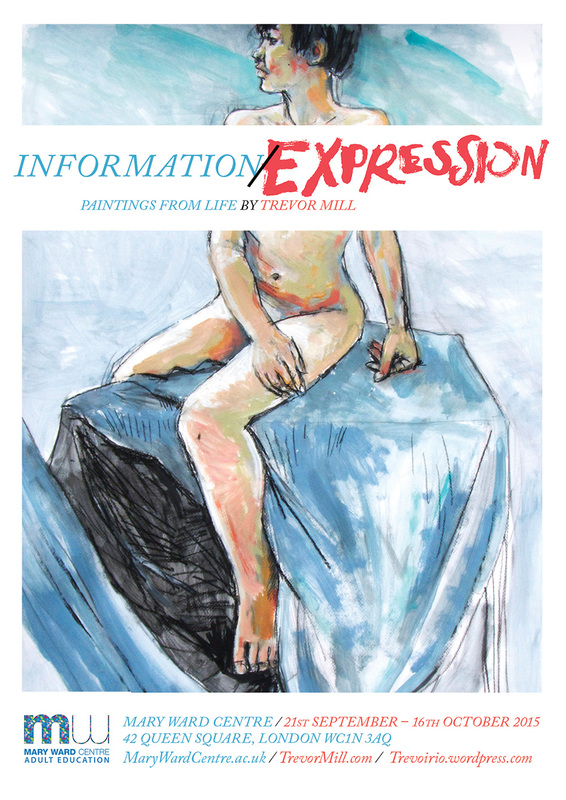 An exhibition of 26 large life drawings/paintings. An exhibition of 15 paintings from the previous 16 years. An exhibition of 32 paintings and sculptures. The Mary Ward Centre specialises in adult education with a difference. Known as the Friendly place to learn, it provides a wide range of part-time courses during the day, evening or weekend, at all levels. It has brilliant tutors, great facilities and an exceptional vegetarian café. This entry was posted in Art, Life Drawing, Posters., Press and tagged exhibition, fine art, life drawing, London art, Painting. Bookmark the permalink.